Those of you who were following me last year may remember the blog went all French in July. 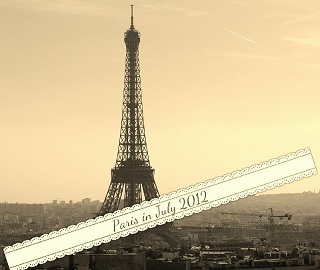 Well I'll be at it again for Paris in July 2012! Rest assured, I won't be blogging in French (I only know a few words) but I'll be reading some translated fiction and cramming in as much as I can with a French theme. Here's some of my posts from last year if you're looking for ideas. I'm looking for guest bloggers, photography and recipes to feature during July so get in touch if there's something you'd like to offer. I'm also after great translated French fiction to review. Paris in July is hosted by Book Bath and Thyme for Tea. oooh interesting, how do you find themed books? Last year I asked publishers that focused on translated fiction and got some great, surprising reads. I have a few from Gallic Books on my TBR at the moment and have asked around again this year. Welcome to Paris in July. I'm so looking forward to the fun we have. Karen (bookbath) and I (Thyme-for-Tea) will be posting some more ideas over the new few weeks.But as a start you might like to look up the Goncourt Prix - one of the French Litterary Prizes. I bought the latest Anna Gavalda novella but really can't be buying any more books. I will read what I get sent! Ooh, I'll be in Paris in July for a gig and some randomness, so I'm all for this. Also, I'm currently reading Within a Budding Grove by Marcel Proust. France all the way, so I'll return to see what you'll find to read. Tell No One is a great thriller. I don't know Priceless so I'll have to look for it. I have a huge list of French films to watch too!